My bathroom renovation is finally complete. It has been a long six months since my husband and I embarked on our journey to renovate our master bathroom. It all started with me planning to going out of town for four days and husband left home to watch the boys. My husband had nothing planned for those four days, so on a whim, I asked him if he would like to renovate the bathroom. We had been talking about doing this for several years but life kept getting in the way. My husband agreed that my idea was a great thing. So we went to a tile store to get started. The lady at the store convinced us to expand the shower and eliminate the bathtub. We loved the idea of a bigger shower as ours was too small. So we picked out the tile for the floor and shower. I then went out of town and left the boys in charge of demolishing the bathroom. Well during the demolishing, my husband discovered problems that changed our plans which led to delays. Those delays allowed me to do a lot of "window" shopping online to choose items that I wanted in my bathrooms. I also had a couple more trips to get inspire by hotel bathrooms. Hotel bathrooms have always inspired me to redo my bathroom, maybe because they are clean and clutter free. I think having four boys has something to do with my messy bathroom and yes that is a football by my old toilet. The only boy allowed in my new bathroom will be my husband and he better keep it clean. 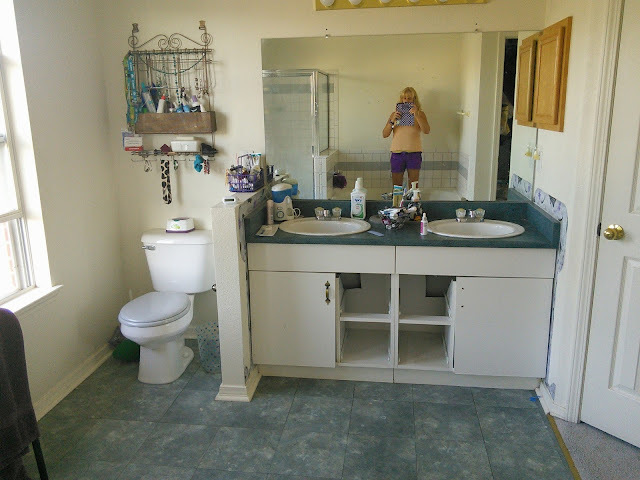 So the above photos are how my bathroom looked and the rest are the new fancy bathroom. My new bathroom just looks awesome and I feel so happy when I am in there. It looks so much better than the bathrooms at my past hotel stay. I might just have to stay at fancier hotels. 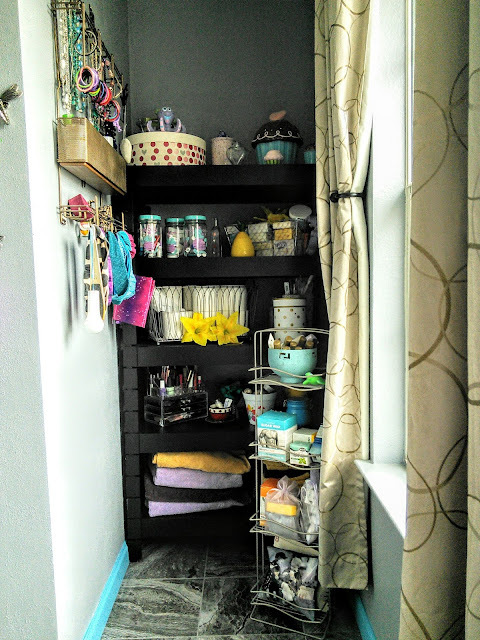 I just love all the space I have in the new vanity and shelf to keep all my items organized. 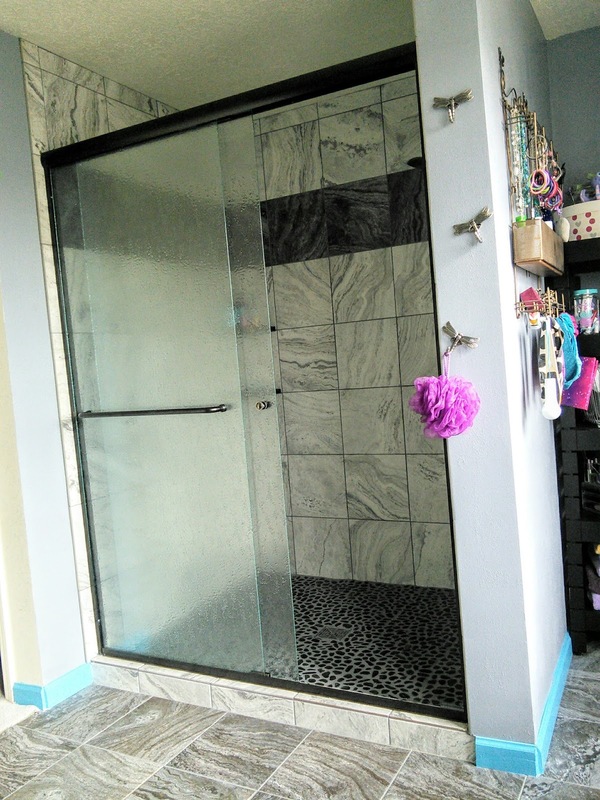 The shower is huge and I may just invite hubby to take a shower with me. The only thing that would make this bathroom more perfect would be a jacuzzi. We did think of that but in the end, we knew we would enjoy a bigger shower. I am glad we had the money to make the bathroom how we wanted as it turned out wonderful. 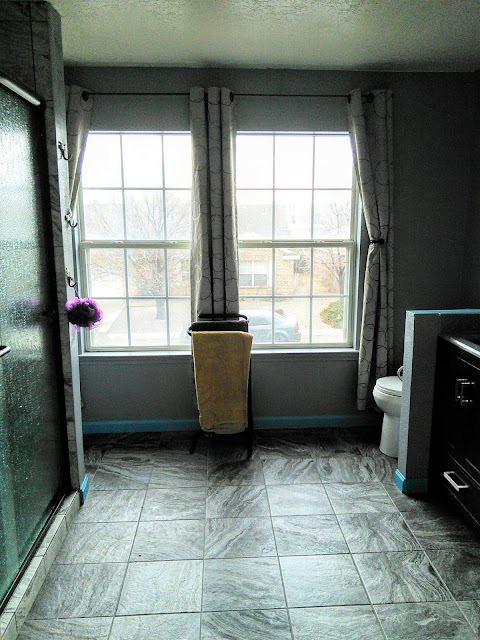 So here are the photos of our new bathroom! Here are some close-up pictures and ones of special touches. I never knew that I could experience joy from a new toilet. 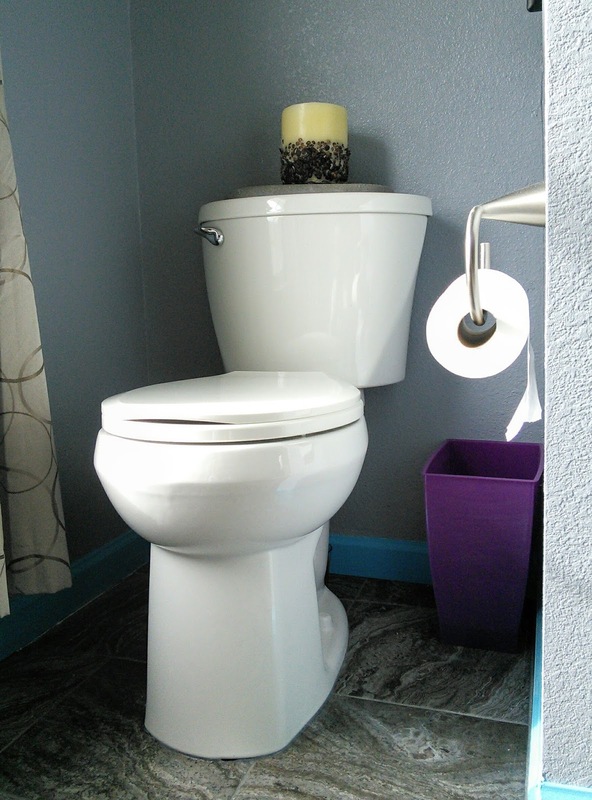 The one that we bought is chair height and it feels so good to sit on a new potty. 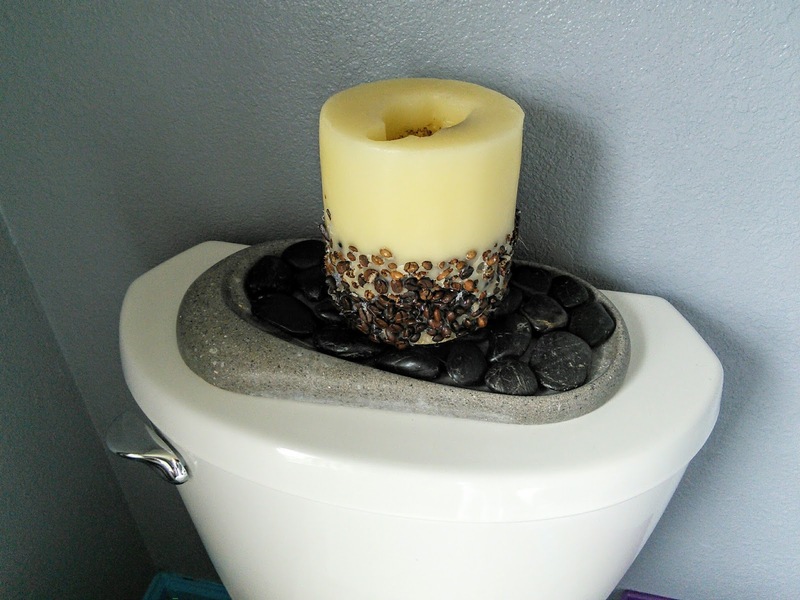 We used the extra stones from the shower for this candle trivet. I love having this shelf for all my beauty products. It helps me to keep it so organized. This rack is great for all my jewelry and hair items. 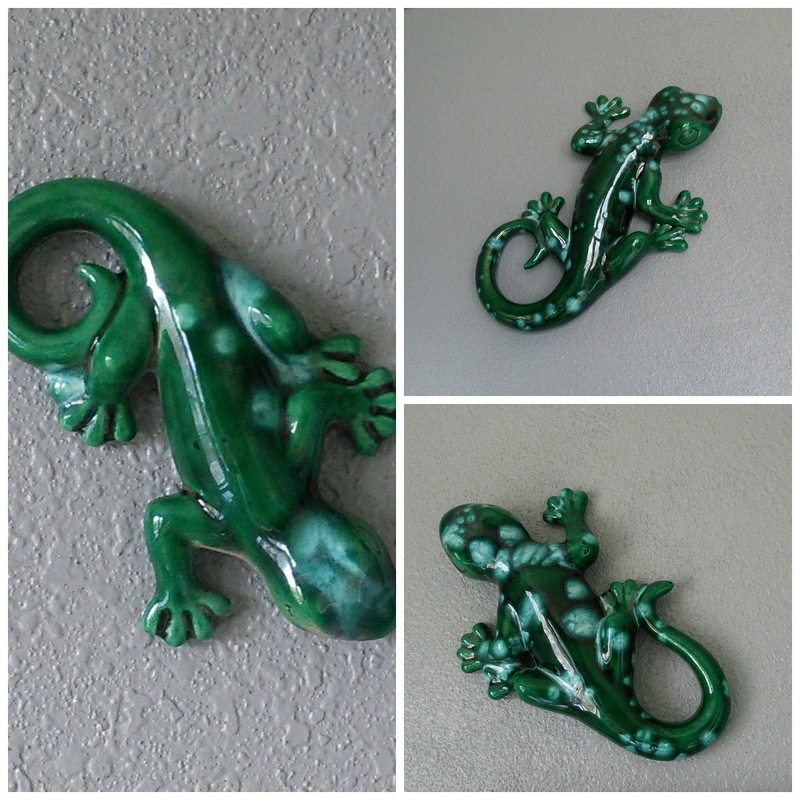 So loving my dragonfly hooks! 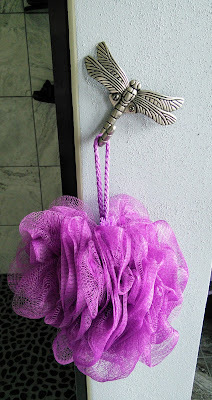 These will be great for hanging our shower robe and clothes on. 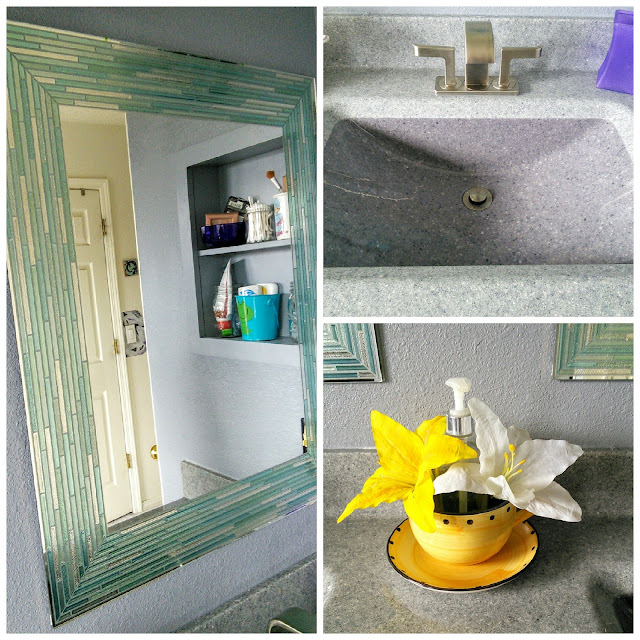 I just love this sea glass mirror and the color we chose for the vanity. Yes, this sink is all one piece! This coffee cup is perfect for the soap as it will keep the drips off the vanity. 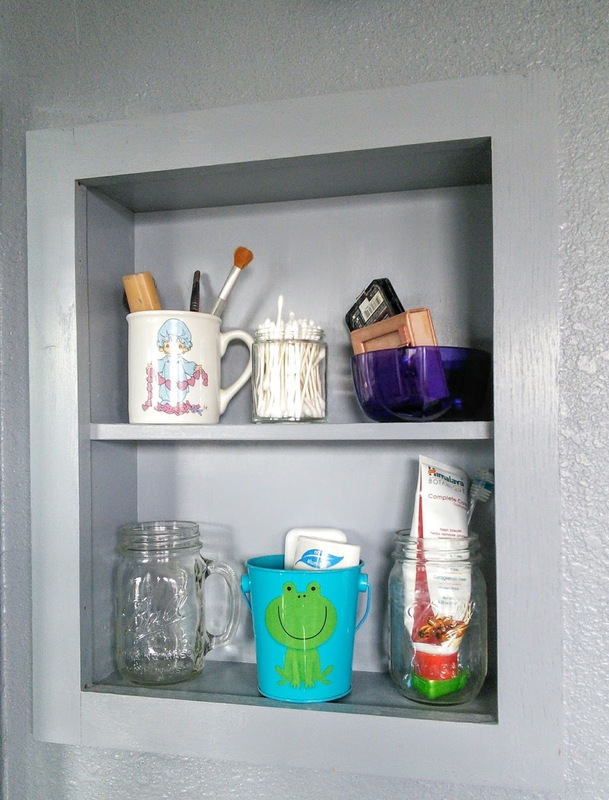 This open shelf used to be a medicine cabinet. 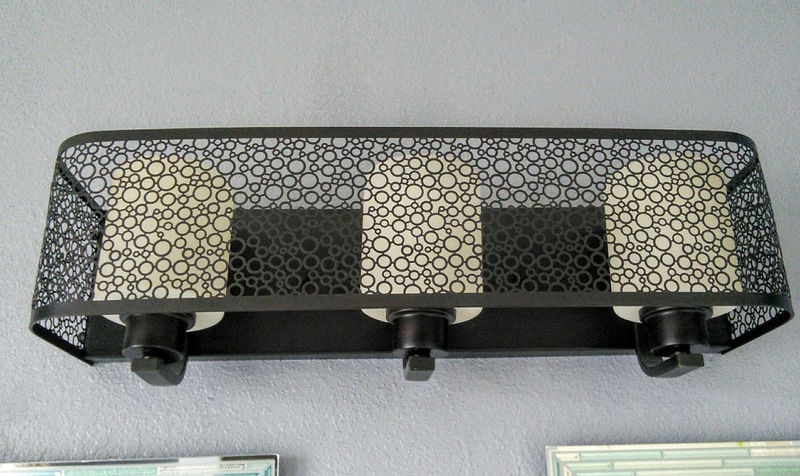 This will keep the clutter off the vanity. Love the light we chose! These cute guys give our bathroom a southwest touch! 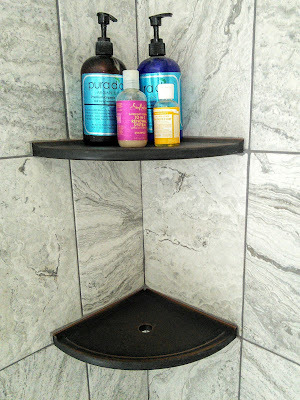 These shelves will hold all my shampoo bottles! 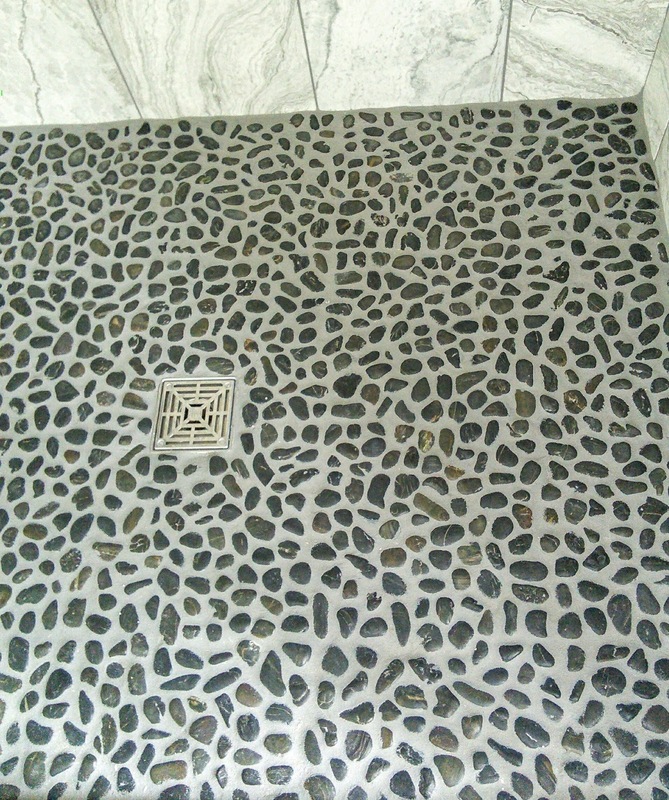 The stones on the shower floor give my feet on awesome massage! I am so happy with my bathroom. It is my favorite room in the house. I will leave you with the before and after photos. The transformation is simply amazing! 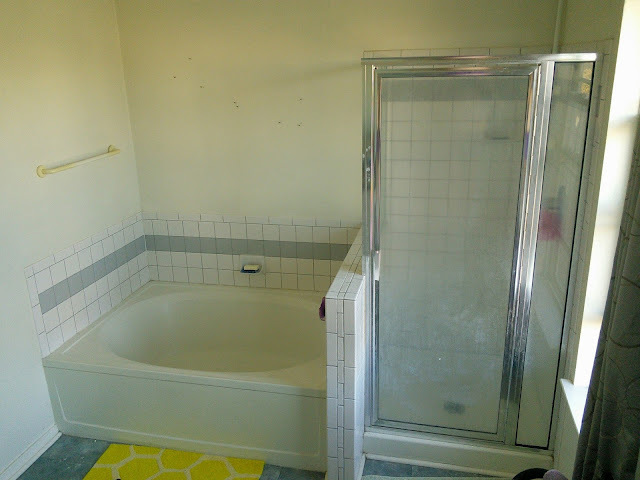 Read previous posts about my bathroom renovation. Looks great! I love the colors! That looks amazing!! What a transformation. I love it! I love the vanity and the beautiful tile in your shower. 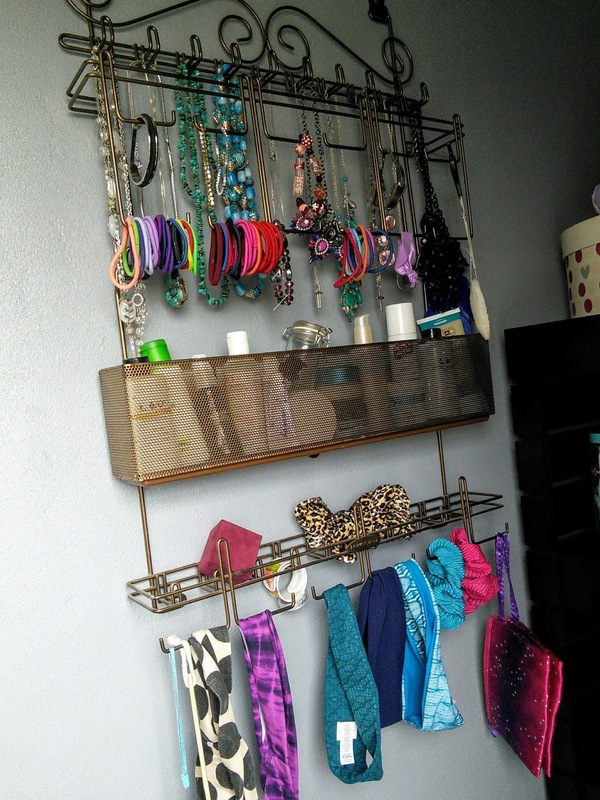 Your jewelry rack is a neat idea for saving drawer space. I won this rack a couple of years ago from another blogger and love it. Wow! Congratulations! Your bathroom looks so wonderful now, I love those colors and mirrors. 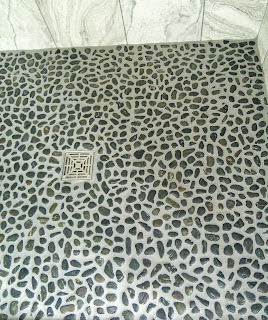 I love the color and the stone flooring. The room was well organized. Good job. I love it!! Your bathroom looks gorgeous. I love that shower. Your bathroom looks amazing! It is always such an incredible endeavor to undertake a new renovation project! I love, love, love your tiles and the flooring! Wow, you've done a great job. I especially love the shelves and the jewelery rack. I really love the renovation of your bathroom, it looks better than before and so neat! What a stunning bathroom! I love the decor and the tiles is so much better now! The shelves are great idea too! I love your flooring, the colors are great!!! The whole renovation turned out great. You've done such a good job - It looks amazing. I love the floor tiles you've chosen and that shower is fab! It's so big! That's a heck of a transformation. I love the new colors! Omg your bathroom is looking fabulous!!! I just love how it turned out!!! You've worked through so many problems, so please take time to step back & admire all you've accomplished. 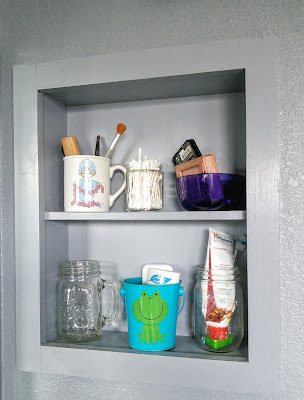 Love everything you've done & glad to see you adding shelves inside the walls. The after looks incredible. 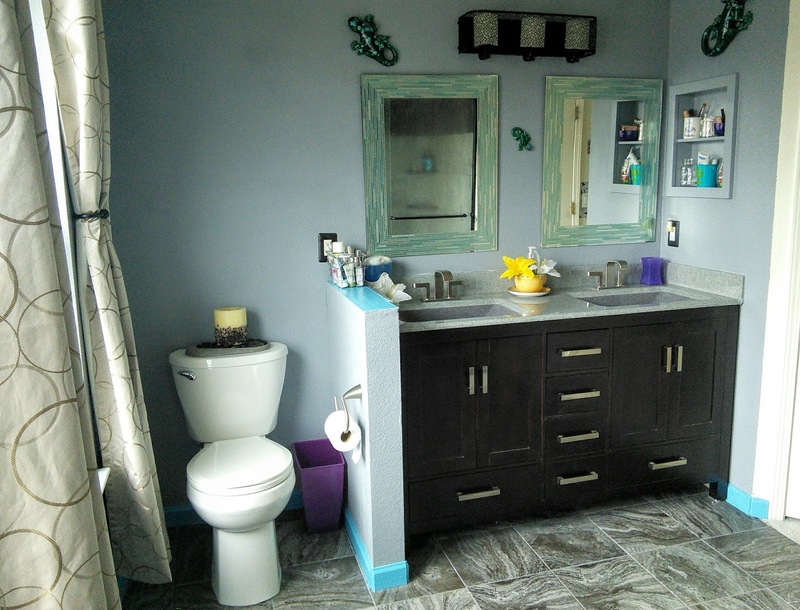 We are totally in need of a bathroom makeover! It's so nice that everything finally came together! I think your new bathroom looks beautiful. I love all the little details! Those dragonflies are a standout! Whoa!! What a transformation!! We are hoping to do a renovation in our bathroom sooner rather than latter and I have been eying a similar shower door for some time now. We have the one you used to have and I hate it. How do you like the sliding door? Oh yeah. It turned out great. I love it. I have 2 under renovation. One almost done and the other I don't know what we are going to do to find a replacement tub that fits.